Thousands of loyal customers have had input in the new version of the adjustable T6 Pro that has been updated with a 3mm longer body to fit on more universal mounts. This not only fits better on a larger variety of mounts, but are more stable with in the quick release style for bike beach patrol officers. 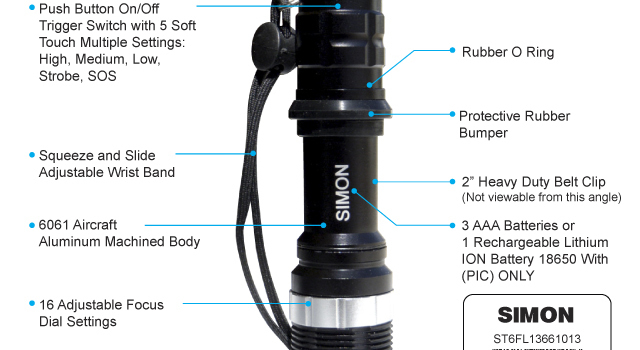 The Simon Cree adjustable T6 pro is now powered by three types of batteries. The first is the popular Simon Panasonic 18650 lithium ion with protected integrated circuits (PIC) then next is rechargeable AAA nickel-metal hydride battery (NiMH) rechargeable and of course the AAA alkaline battery that is readily available just about anywhere on the planet. Law enforcement wanted to have a cheap insurance policy just in case they forgot to bring their spare batteries with them in there cruisers when on night patrol. In some large cities officers do not get the same cruisers every night for patrol and they have to take their entire gear bag with them and transfer it from vehicle to vehicle and in some cases they might forget to charge there batteries and/or forget them all together. So then new options were made available per our customer’s request. Over all the Simon T6 is still a reliable, versatile little work horse of a flashlight that does exactly what is was designed to do. With over one thousand law enforcement personnel suggestions and recommendations for what they wanted in a secondary light for under $30.00 usd it has been clear that this LED flashlight is still evolving. We here at Simon Flashlights still think as technology improves in the light emitting diode industry that there will be new advances in chip sets and diodes for longer run times. Also new advances in rechargeable batteries that are coming to attrition that should be hitting main street consumers with in the next few years as long as government regulators don’t get involved and add more expense and delays. One of the most important take always from this post is that you must have a good reliable set of batteries that have a consistent run time. The overall best batteries that we have tested are the two rechargeable batteries. The Simon Panasonic 18650 with PIC 3100 mAh or higher and the Panasonic from Japan private labeled Amazon AAA rechargeable nickel-metal hydride. I hope understand that the Simon adjustable T6 Cree flashlight is a good tool, but what makes it a great tool is that you use the best power supply of batteries that you can get your hands on to get the most out of the Cree T6 chip set that is built into the Simon T6 flashlight. I was so pleased with my purchase of the T6 that I bought two more. Very cool. I just bought a Simon Cree T6 Pro and i loved it so far. Thanks for the information The T6 LED flashlight is small and is a really good light i have learned how to use the Simon T6 Cree LED Flashlight while i was camping. Awesome little light.